Background: There is evidence that changes in neuro-immune responses coupled with dysfunctions in serotonin metabolism underpin the pathophysiology of autism spectrum disorders (ASD). Objective: This study aimed to delineate whether ASD subgroups or characteristics show aberrations in tryptophan and brain-derived neurotrophic factor (BDNF) metabolism. Methods: 65 individuals with ASD (diagnosed according to ICD criteria) and 30 healthy control patients were included. Measured were serum levels of tryptophan, kynurenine (KYN), kynurenic acid (KA), quinolinic acid (QA), BDNF and PRO-BDNF and total blood 5-HT and 5-OH-tryptophan (5-HTP). Results: Elevated BDNF levels and lower tryptophan and KA levels were characteristics of both childhood autism and intellectual disability disorder, whilst elevated tryptophan and lower 5-HT synthesis were hallmarks of Asperger syndrome. A pathological MRI was associated with elevated tryptophan and lowered KA. Abnormal EEG results and dysmorphology were both associated with an elevated BDNF/ PRO-BDNF ratio. Any brain pathology and gastro-intestinal symptoms were accompanied by lowered KA. 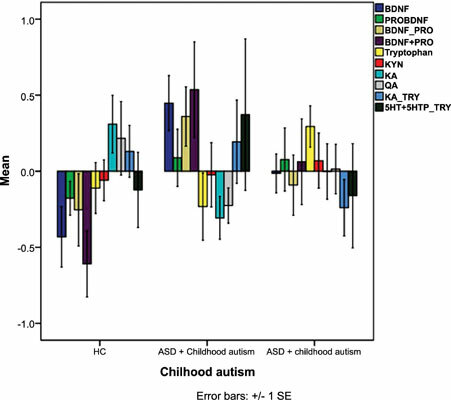 Conclusions: Increased BDNF production and changes in the metabolism of tryptophan are associated with many ASD characteristics, showing particularly strong associations with childhood autism and Intellectual and Developmental Disabilities. Peripheral BDNF and tryptophan metabolism appear to take part in the pathophysiology of autism spectrum disorders and their phenotypes. Autism spectrum disorders, tryptophan catabolites, brain-derived neurotrophic factor, serotonin, intellectual disability disorder, neurological development disorder.